Olathe North 22, Lawrence Free State 18 – Free State built an 18-7 lead on two touchdown passes from Joe Dineen to Keith Loneker, but Olathe North rallied to defeat the Firebirds for the second time this season. In the third quarter, Cole Murphy hit Chaz Burgess on a 24-yard touchdown pass to pull the Eagles within 18-15. After a Free State fumble, Marcel Spears scored around right end from 16 yards out to give North a 22-18 lead. Free State converted two fourth-down passes on their final drive, but Burgess intercepted Dineen in the end zone with under 30 seconds to play. Free State had six turnovers in the game. Shawnee Mission East 20, Olathe East 13 – Olathe East took an early lead on a Jalen Branson touchdown run, but Shawnee Mission East responded with the next 20 point before halftime. Gunner Englund tossed touchdown passes to Mitchell Tyler and Alec Dean for the Lancers. Shawnee Mission East will take on Olathe North in the Sub-State semifinals. The Lancers defeated the Eagles 23-22 on a late touchdown back in Week 4. Derby 55, Manhattan 20 – Manhattan jumped on top-ranked Derby 7-0 after Henry Bieber returned the opening kickoff 90 yards for a score. After that, the Panthers couldn’t be stopped. Jeremy Dunham rushed for a touchdown and threw two touchdown passes as Derby raced out to a 34-7 halftime lead. Caleb Arnold also saw time at quarterback and broke an 85-yard touchdown run, threw a touchdown pass, and caught a touchdown from Dunham. Tyler West led Derby with 175 yards on the ground and three scores. Garden City 35, Wichita Heights 28 – Wichita Heights led 28-14 at Garden City in the third quarter before Greyson Tempel led the Buffaloes back. Tempel tossed a 22-yard touchdown pass to his twin brother Dustin in the third quarter, and a 7-yard score to Caleb Tramp with just under 2:30 remaining to tie the game at 28. After a key Falcon fumble, Tempel led a quick drive that included connections with his brother Dustin and Tramp again. The senior quarterback then did the rest with his feet scoring from 8-yards out to give the Buffs the lead with under a minute to go. Blue Valley 38, Mill Valley 0 – Chance Nelson rushed for 142 yards and a touchdown and Montana Brady added 106 yards and two scores as Blue Valley rolled past Mill Valley. The Tiger defense was the difference, holding Mill Valley to 18 yards rushing on 31 attempts. Blue Valley West 38, Bishop Miege 24 – Blue Valley West built a 17-0 lead and held off Bishop Miege 38-24. Miege could not overcome four first-half turnovers, but only trailed 24-17 at the break. The score remained 24-17 into the fourth quarter before the Jaguars added two touchdowns to lead 38-17. Grant Garcia scored twice and rushed for 140 yards for West. Ryan Ralston passed for more than 100 yards and a touchdown. For Miege, junior quarterback Ryan Willis passed for 460 yards and three touchdowns, but was intercepted five times. Salina South 21, Bishop Carroll 19 – Salina South snapped Bishop Carroll’s 23-game winning streak with a thrilling 21-19 win. The Cougars outgained Carroll 285 yards to 79 in the first half, but led only 14-7. Bishop Carroll pulled closer on a Colton Howell touchdown pass to Blake Newell, but the PAT hit the upright. The Eagles got the ball at the Cougars’ 21-yard line in the fourth quarter, but missed a 35-yard field goal. Mike Jones then broke a 78-yard run to give Salina South a 21-13 lead. Carroll would answer on 4-yard touchdown run by Howell with 50 seconds remaining to pull within 21-19. Howell rolled to his right and hit Tory Smith on the two-point conversion pass, but Smith was ruled out of the end zone. Carroll’s onside kick attempt was snagged by Zach Nachbar and returned to the Eagle 4-yard line where Salina South ran out the clock. Kapaun Mt. Carmel 44, Salina Central 42 – Salina Central built a 21-7 lead in the first half, but Kapaun eventually tied the game at 28 heading into an exciting fourth quarter. The scoring began in the final period with Malik Veal’s third touchdown run of the night to give the Mustangs a 35-28 lead. Kapaun responded as Ethan Harp scored from a yard out with 3:17 remaining. The Crusaders converted a two-point conversion to take a 36-35 lead. Kapaun then got the ball back in Salina Central territory after holding the Mustangs to nine yards on fourth-and-10. Harp scored on a 19-yard touchdown shortly after, and another Kapaun two-point conversion made it 44-35. Salina Central scored with six seconds remaining to get to the final two-point margin. Paola 27, KC Piper 21 – Paola built a 24-7 lead in the third quarter and held on for a 27-21 win at KC Piper. Luke Wilson kicked a pair of field goals (48 yards and 30 yards) that turned out to be the difference. Andrew Henn rushed for 105 yards and a touchdown to lead the Panthers. Corey Stallbaumer also added 87 yards and a score. Tanner Eikenbary led Piper’s comeback with 293 yards passing and three touchdowns. 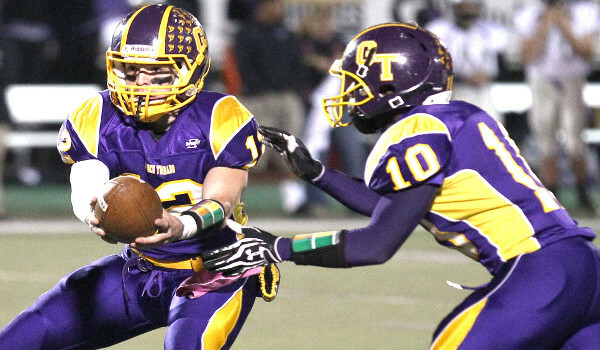 Paola held Piper to 20 rushing yards on 23 attempts. Coffeyville 35, Baldwin 27 – Coffeyville scored 35 consecutive points to turn a 14-0 first-half deficit into a 35-14 lead. The Golden Tornado held off previously unbeaten Baldwin 35-27 to advance to the state semifinals for the first time in school history. LaDarrius Johnson and Nathan Finley each rushed for two touchdowns and Finley hit Darron Deffebaugh on a 37-yard strike for Coffeyville. Holton 24, Andale 14 – Andale led Holton 7-3 at halftime, but the Wildcats turned things around in the second half after a solid kickoff return by Brenden Hampton resulted in a 52-yard scoring drive. Drake Ewing gave the Wildcats the lead for good with a 5-yard score. Holton’s defense stopped Andale on fourth-down twice in the second half and turned both occasions into touchdowns. Hampton scored on a 14-yard run to make it 17-7, then iced the game with a 57-yard touchdown run mid-way through the fourth quarter. He finished with 160 yards on the ground, two touchdowns, and kicked a 28-yard field goal. Buhler 27, Topeka Hayden 18 – Buhler scored 20 points in the second half ignited by all-state running back Riley Allen. Trailing 10-7 at halftime, Allen scored touchdown runs of 19 and 68 yards in the third quarter to give the Crusaders a 21-10 lead. Hayden answered with a touchdown by J.C. Menke to pull within 21-18, but Jace Williams 10-yard run in the fourth quarter sealed the win for Buhler. Allen finished with more than 175 yards rushing on the night. Silver Lake 41, St. Mary’s Colgan 7 – Silver Lake scored three times in the fourth quarter to put away Colgan 41-7. The Eagles returned two Luke Marquardt passes for touchdowns on the night, including a 47-yard pick-six before halftime by Zach Boyd that put the Eagles up 20-0. Colgan pulled within 20-7 in the third quarter and was driving past mid-field before a fumble gave the ball back to the Eagles. Dailin Kruger passed for 273 yards and two touchdowns in the win. Rossville 48, Cherryvale 0 – Rossville had little trouble on the road at Cherryvale. The Bulldogs exploded for 21 points in the first quarter and led 41-0 at halftime. Rossville advances to host rival Silver Lake in the 3A state semifinals. It will be the seventh time the two schools have met in the 3A Sub-State semifinals with Silver Lake winning all seven prior meetings. The Bulldogs beat Silver Lake 27-21 earlier this season. Beloit 66, Sedgwick 41 – Sedgwick built a 28-14 lead on top-ranked Beloit in the second quarter thanks to three Brylie Ware touchdown passes. From then on, Beloit outscored the Cardinals 52-13 to advance to the state semifinals for the third time in the past four seasons. Bowe Behymer rushed for three touchdowns and caught two touchdown passes from Payton Vetter. Vetter tossed three touchdown passes on the night and rushed for two scores. Ware passed for four touchdowns for Sedgwick. Centralia 36, Olpe 0 – Centralia posted its sixth shutout of the season by blanking Olpe 36-0. Sam Steinlage rushed for two touchdowns, caught an 85-yard touchdown pass from J.T. Rosine, and returned an interception for a fourth score. Rosine added the other Panther touchdown on a short run in the third quarter. Lyndon 37, Troy 8 – Lyndon led Troy 14-8 at halftime, then exploded for 16 quick points in the third quarter to pull away. Joe Walsh returned from injury and scored on a 10-yard run to extend the Tiger lead to 21-8. The Tigers then got a safety after Troy quarterback Tristan Speer was called for intentional grounding in the end zone. Shortly after, Josh Owens broke a 53-yard touchdown run to put the Tigers up 30-8. Owens finished with 200 yards rushing and two scores on the night. La Crosse 12, Oakley 7 – La Crosse and Oakley were scoreless until 6:32 remaining in the fourth quarter. That’s when Leopard quarterback Jack Garcia scored on a 7-yard touchdown run on fourth-and-goal to give La Crosse a 6-0 lead. Oakley scored shortly after to take a 7-6 lead. La Crosse reached the Plainsmen 5-yard line with under a minute to play. On fourth-and-goal, Garcia hit Marshall Jay on a 5-yard touchdown pass to give La Crosse the 12-7 lead with 17 seconds remaining. Oakley completed a wild hook-and-ladder play, but ran out of time. Meade 28, Smith Center 0 – Meade shutout Smith Center to advance to the state semifinals for the second consecutive season. Jett Little rushed for 177 yards and scored three touchdowns on the night. Morgan Olvera added 175 more yards on the ground and the other Buff touchdown. Osborne 42, Clifton-Clyde 34 – Osborne built a 20-6 halftime lead, but Clifton-Clyde came storming back in the second half. The Eagles tied the game and eventually took a 34-26 lead in the fourth quarter. Top-ranked Osborne, which beat Clifton-Clyde 80-32 in district play, scored to tie the game with under two minutes remaining and took the lead on a touchdown with 37 seconds left. The Eagles mounted a last drive that ended with an Osborne interception with 14 second remaining. Hodgeman County 58, Hoxie 26 – The Longhorns pulled away in beating Hoxie 58-26 to advance to the state title game for the first time since becoming Hodgeman County. Leading 20-14 in the second quarter, the Longhorns got a stop and Kolt Washburn broke a 51-yard touchdown run to put Hodgeman County up 28-14 at halftime. The second half belonged to the Longhorns as Washburn scored twice more as part of his 135-yard night. Alex Kreger scored four times for Hodgeman County and rushed more than 225 yards. Baileyville B&B 60, Hanover 14 – Baileyville B&B advanced to a sixth straight state football championship game, with a 60-14 win over Hanover. The Falcons led just 22-14 at halftime, but exploded for 32 points in the third quarter taking advantage of Hanover turnovers. Five of the six Hanover turnovers came in the second half. Dustin Rottinghaus passed for more than 300 yards and eight touchdowns on the night and also picked off two passes on defense.